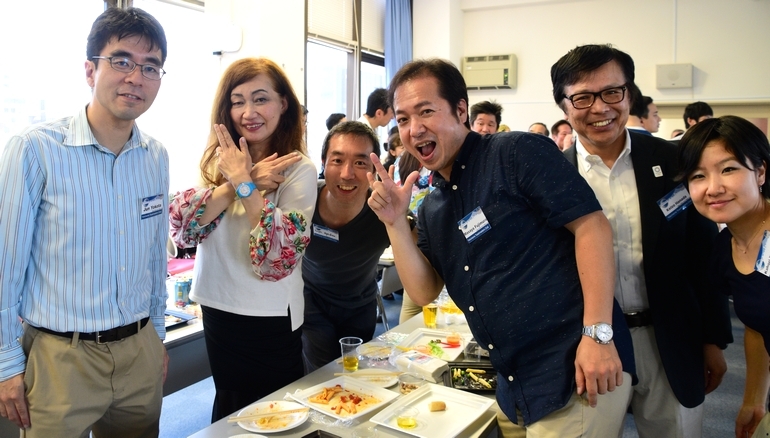 The 667th regular meeting of YTMC was held at our home ground, Hatoba-kaikan, on May 19th. We had one of the most important events of YTMC activities, which was officers’ election!! President T conducted it smoothly, and all candidates got elected! Congratulations!! New President F gave his speech representing new cabinet. The new term will start from this July! There was another special event during this meeting. That was the induction ceremony for TM O. And guess what? His mentor is me! I’m really glad to be his mentor. I’d like to enjoy YTMC activities with him. 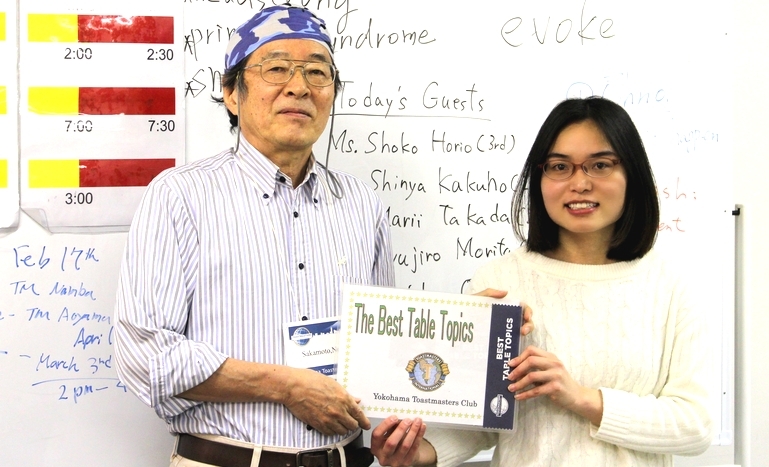 On this day, The Table Topics Session was very thrilling. The Table Topic master was our TM S., and she set a unique rule in the session. She made word cards, and an assigned member chose one of them. He or she explained the chosen word in about 2 min. without using the word itself. After his or her speech, audience guessed the answer! Six speakers struggled to explain the words because many words were difficult. But TM I explained his chosen word perfectly, and he got the Best Table Topics Speaker Award!!! FYI, the word he chose was “FBI”!! There were three speakers in the Prepared Speech Session. They gave their own speech with performances reflecting their characters. 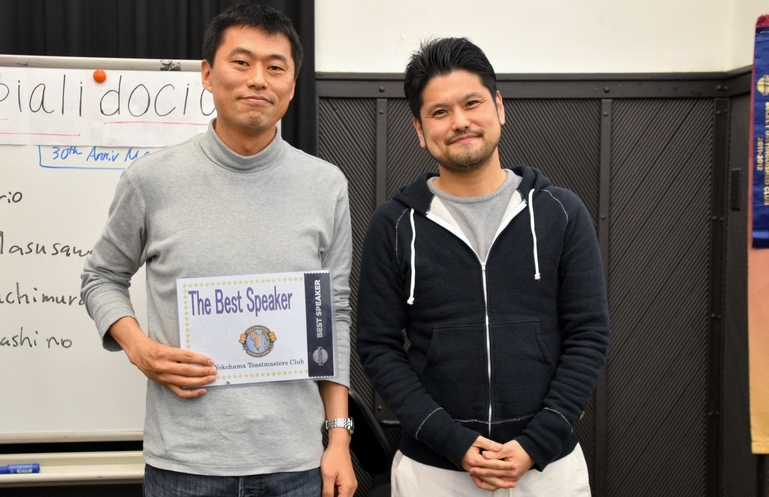 As a result, TM T got the Best Prepared Speaker Award! She sang in her very beautiful voice during her speech as well as told us how to make a beautiful voice. What a beautiful voice it was, wasn’t it! She could involve the audience in her speech with her beautiful voice! We also had three respective evaluators, and TM A got the Best Evaluator Award! She told us how to show the 1st slide of powerpoint effectively. It was very useful and accurate! The time schedule for this meeting was tight. However All role takers managed time well and as a result, we could finish the meeting almost as planned. Thanks all of you for your effort and cooperation! The next meeting will be the YTMC 30th Anniversary Special Meeting! This is a very important event just like the officers’ election. Don’t miss it! 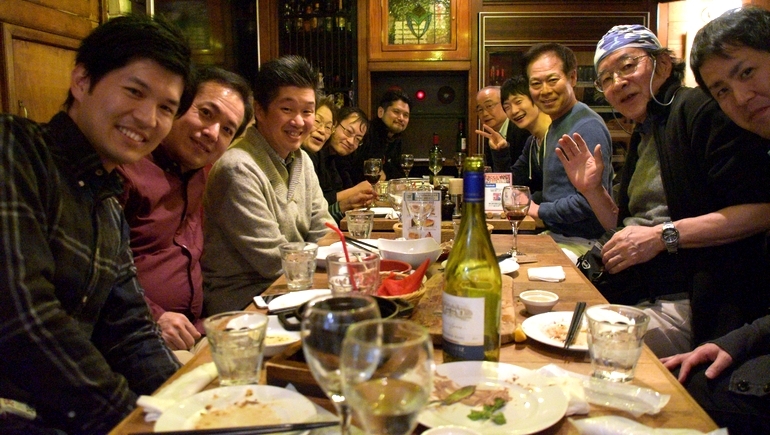 The last meeting #666 was held in the latter half of Golden Week holidays, but many members and guests joined it. 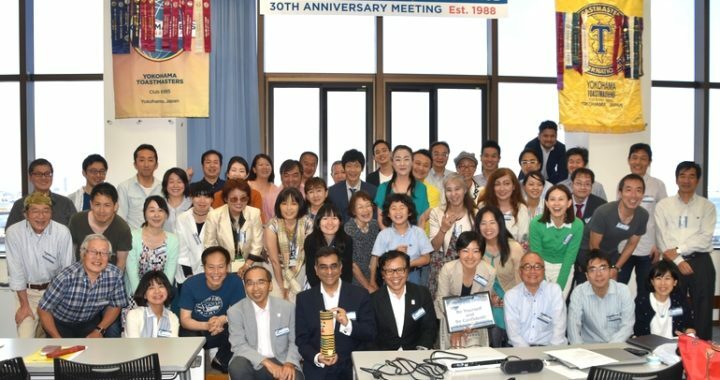 The meeting theme was “Discovery Through Travel.” Members had given me a variety of comments about it and although I wanted to share all of them with other members, I only introduced keywords of them at the meeting. Questions asked in Table Topics Session fit each speaker and all of them could show their own episodes. In this meeting, two speakers tried the Ice Breaker speeches based on our new education system, Pathways. They were well prepared and the audience enjoyed them. 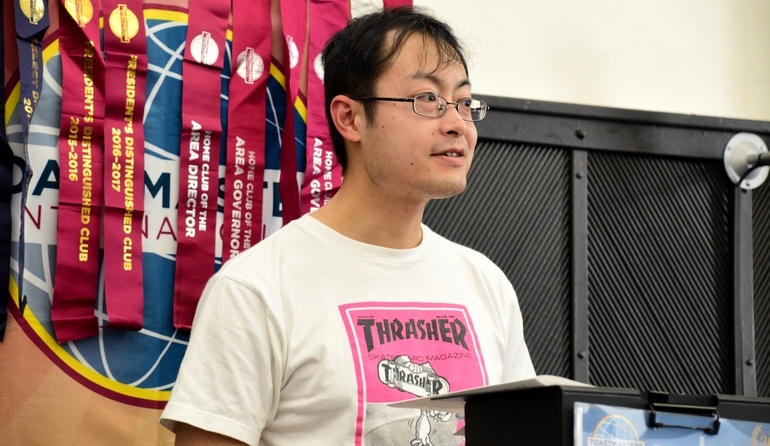 After the meeting adjourned, we had an opportunity to hear a rehearsal speech made by TM O, who was going to participate in the Toastmasters International District 76 Spring Speech Contest. It was great and I was happy to be given such a precious opportunity to listen to it before the big contest. I believe this meeting was a memorable one. 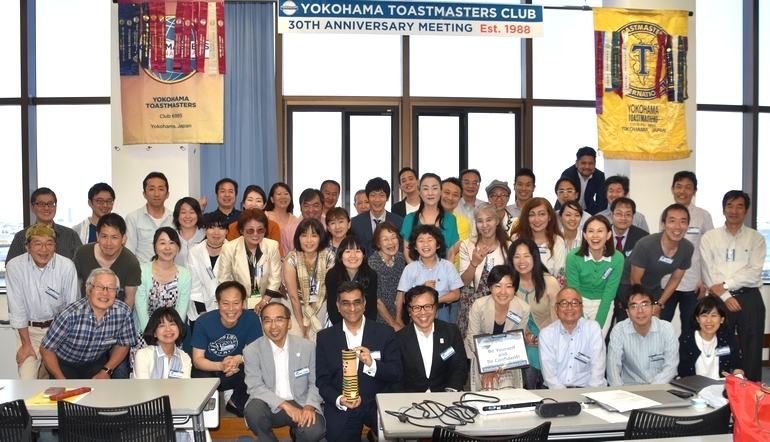 The #665 regular meeting of YTMC was held at Hatoba Kaikan on April 21. The venue was by the sea and we could see the beautiful scenery of Minato-Mirai area. The weather was fine and we felt good. 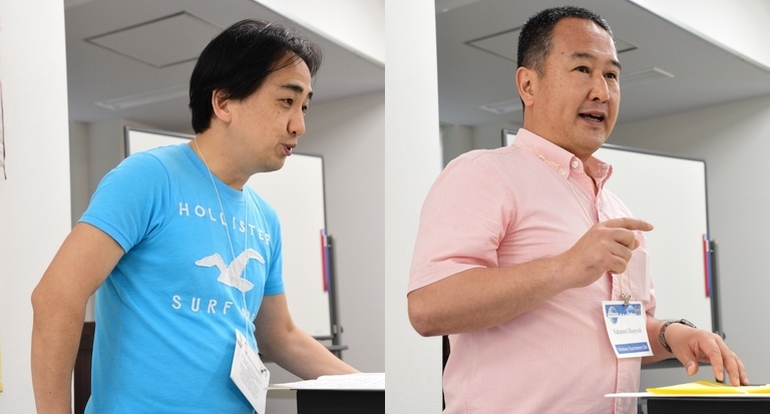 The meeting theme was “Start”, and many members gave their comment about it. At the Table Topic Session, TM O took the role of the Topic Master. He asked questions and called on some members to answer them. The appointed members made short impromptu speeches which usually last for around two minutes. He asked a variety of questions regarding “Journey” and we enjoyed the session. 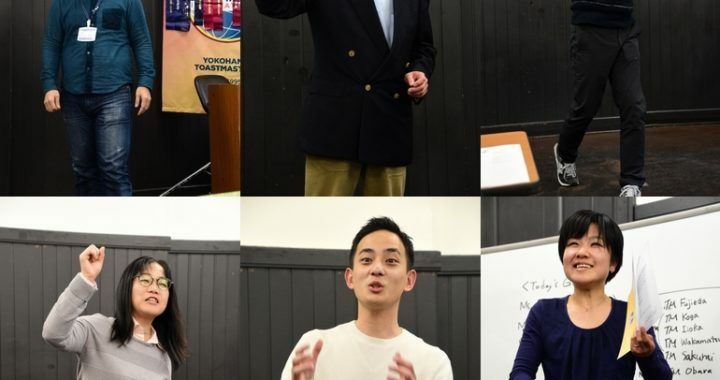 At the Prepared Speech Session, four speakers gave us their unique speeches. 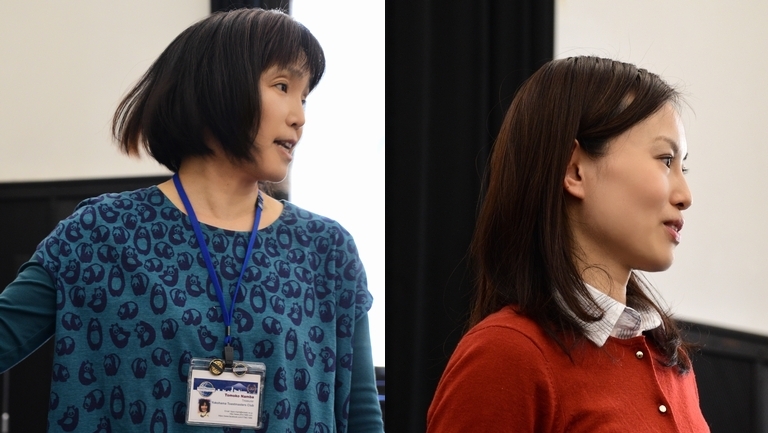 TM S made a speech about the ”Rookies’ Speech Contest” amusingly. TM N.T. delivered a folktale of “The emperor’s plum tree” with deep expression and feeling. 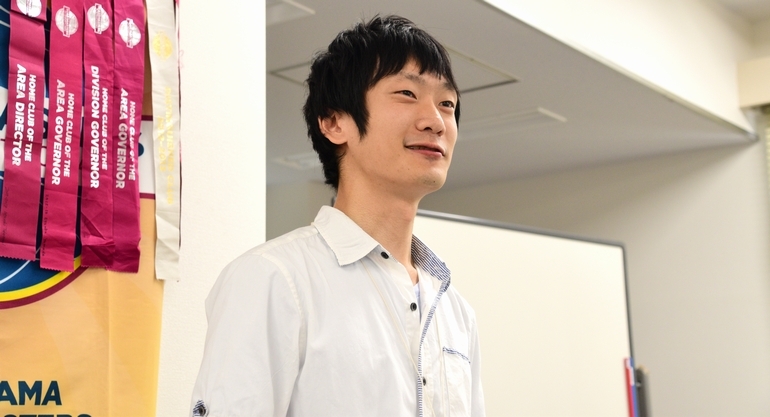 TM M gave us a speech about “Hokke Incident” that happened in his family in Hokkaido enjoyably. The last speaker TM N.M. rendered a speech on “Useful rope knots” with the actual demonstration. All speakers entertained us with their attractive speeches. 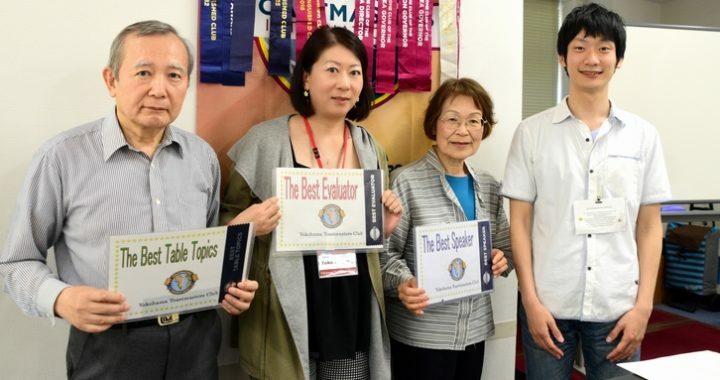 At the Evaluation Session, four evaluators made evaluations for each speaker respectively. Each speech has predetermined speech objectives and evaluators would evaluate each speech from the viewpoint of each project’s objectives. All evaluators got to the point and they were useful not only for the speakers but also for my study. And then, General Evaluator TM S pointed out pros and cons of the whole meeting. I’m also grateful to her for her accurate advice on my performance as a TMOD. 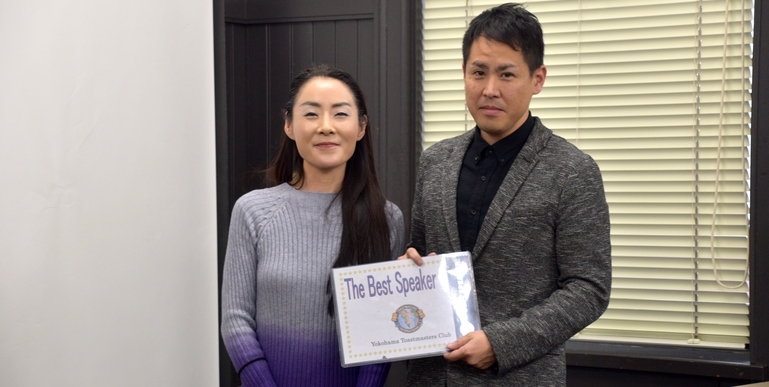 At every meeting, we vote for the best speaker for each session. The Best Prepared Speakers were TM S and TM N.T. (they had tied score). 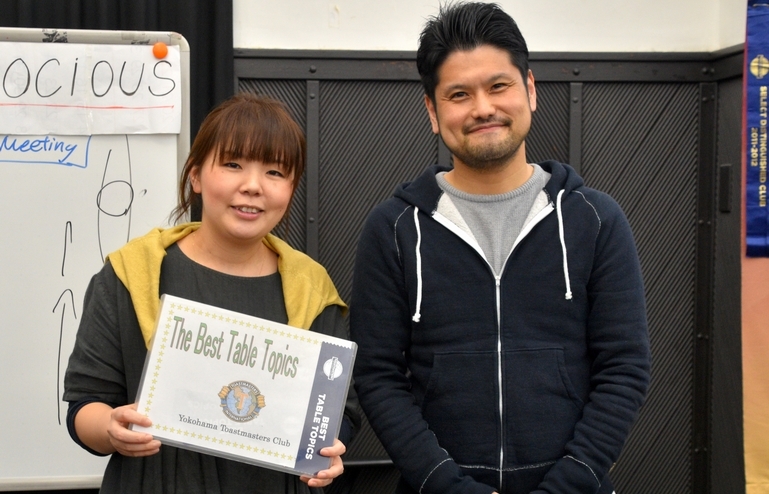 The Best Table Topic Speaker was Mr. K (guest). The Best Evaluator was TM A. Although I took the TMOD role for the first time in a year, as this was the 5th TMOD role for me I was relaxed the best of all time. I enjoyed every speech from my heart and this time I was relaxed enough to see faces of the audience during the meeting. 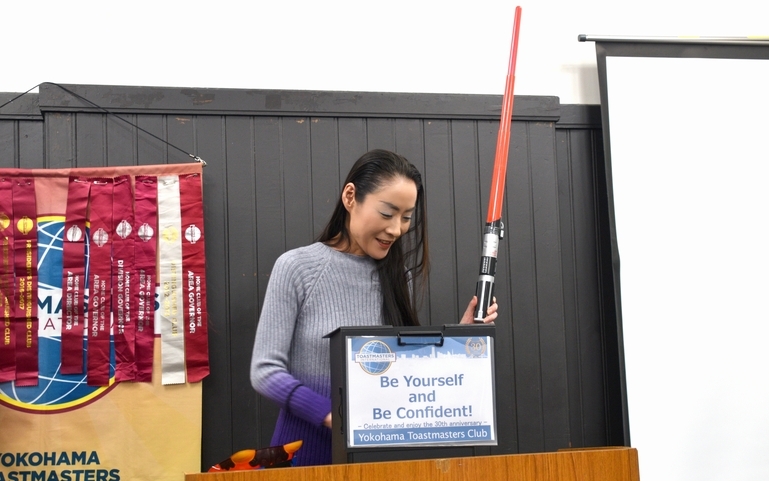 When I first started Toastmasters activity I had no confidence, I stood at the podium like a stone statue with my heart beating so fast that it almost exploded. 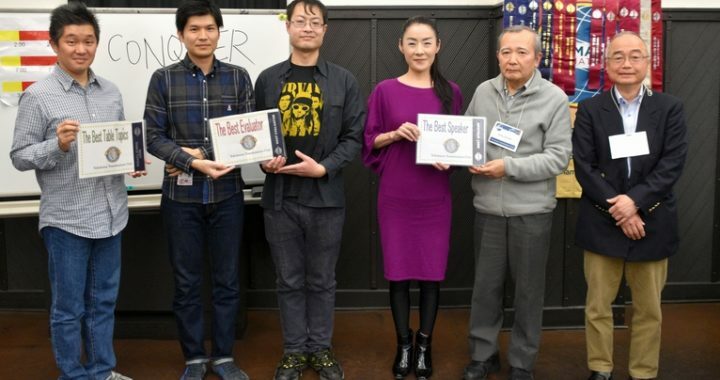 However, thanks to Toastmasters activity and YTMC members’ kind support, I’d made a progress and was confident enough to stand there relaxed and smiling. I’m looking forward to taking the next TMOD role with further progress. The #664 YTMC meeting was held at Yokohama City Port Opening Memorial Hall. 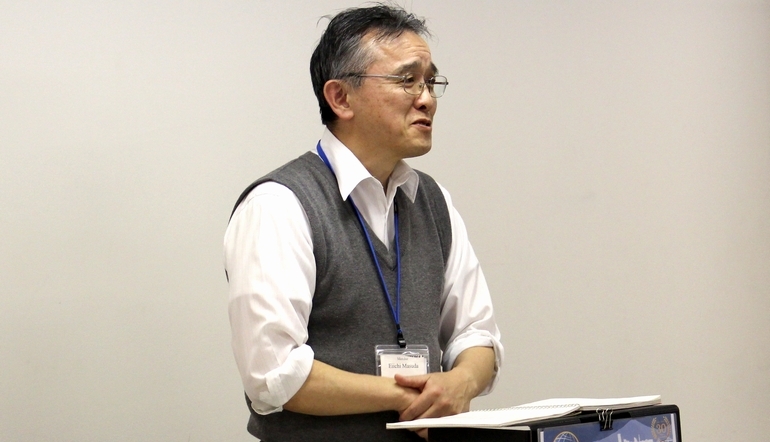 The theme of the meeting was chosen as “Renascence” since the 1st week of April this year was Easter holiday that celebrates the resurrection of Jesus Christ. The word of the day was very interesting and challenging. TM N gave us “Supercalifragilisticexpialidocious”, which was taken from a song in the movie “Mary Poppins”. All speakers struggled to use this super-long coined word. 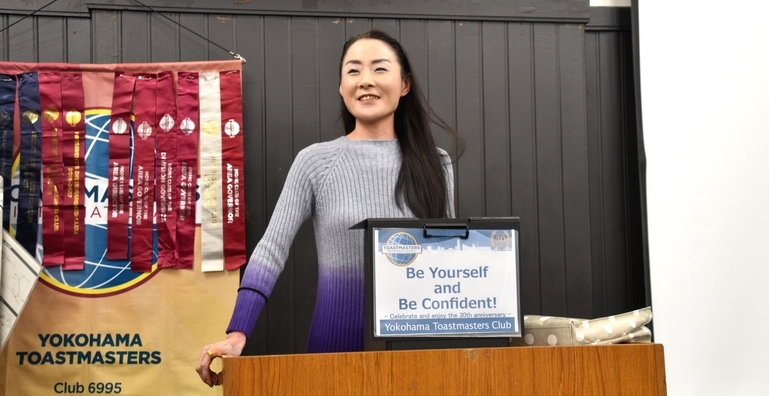 In the Table Topic Session, TM H, who had newly joined our club, gave us a speech showing enthusiasm for Toastmasters as her new challenge. 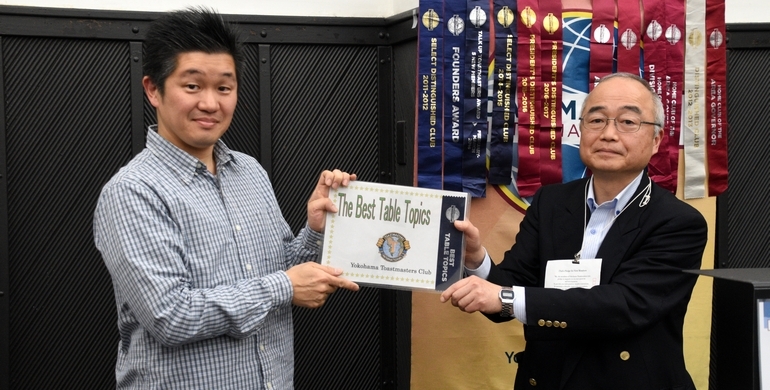 TM A won the Best Table Topic Speaker award. 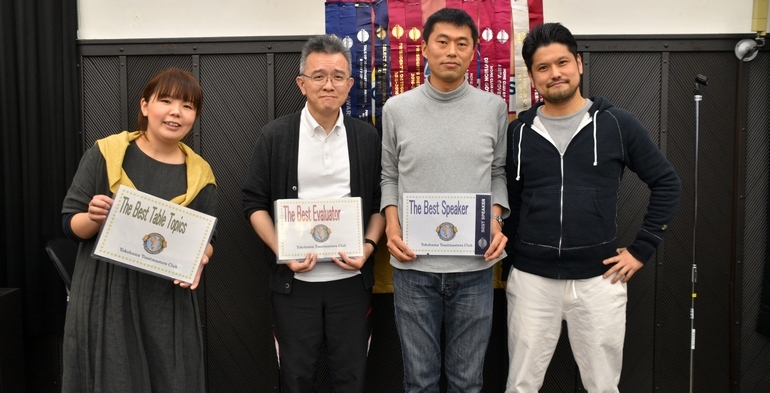 Four prepared speakers performed their speeches in the Prepared Speech Session. TM T and TM M made speeches based on the project #2 of CC manual from their own perspective. The speech of TM K was the very first one based on Pathways, and he introduced his very rare family name and how to use his name to remember him. 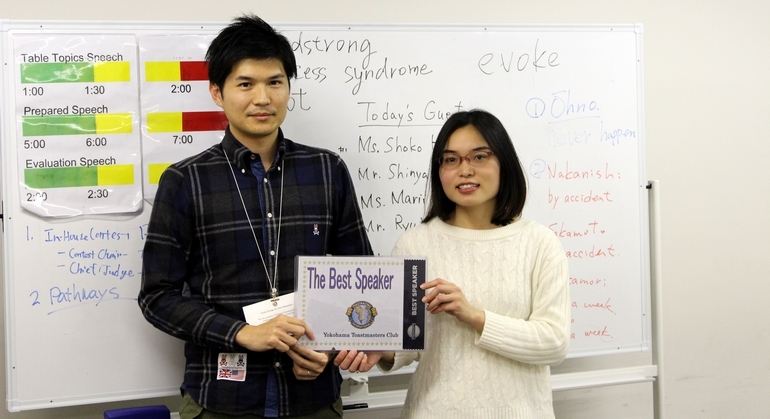 He earned the Best Prepared Speaker award at his first challenge on making a public speech in the club. Congratulations! TM K completed a storytelling advanced manual as a veteran. Great job. TM A took the General Evaluator’s role for the first time and conducted the session as if she had done this many times and provided critical views to all participants. All evaluators performed wonderful speeches, and TM M was given the Best Evaluator award. The meeting was filled with more laughter than usual since everyone tried to use the word of the day but most of them did not speak it correctly and created innovative words instead. Finally, I would like to express my appreciation towards participants, especially to supporters. The #663 regular meeting was held at the Yokohama City Port Opening Memorial Hall on March 17, 2018. The theme was “Regrettable Purchases”. Many stories and experiences were presented and most of them were related to food, clothing, and shelter, which were common concerns to everyone. Interestingly, it was remarkable to see that three members chose a story about the experience on buying real estate as a regrettable purchase. 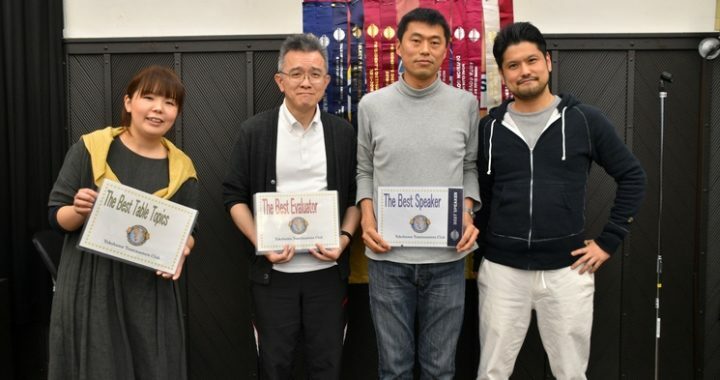 Since the Area Contest was scheduled to be held on the next day of the meeting, we had a special “Rehearsal Session” for the four contestants of our club who would represent us and compete at the contest. In the Prepared Speech Session, we had three wonderful speeches from both Competent Communication Manual and Advanced Manual. 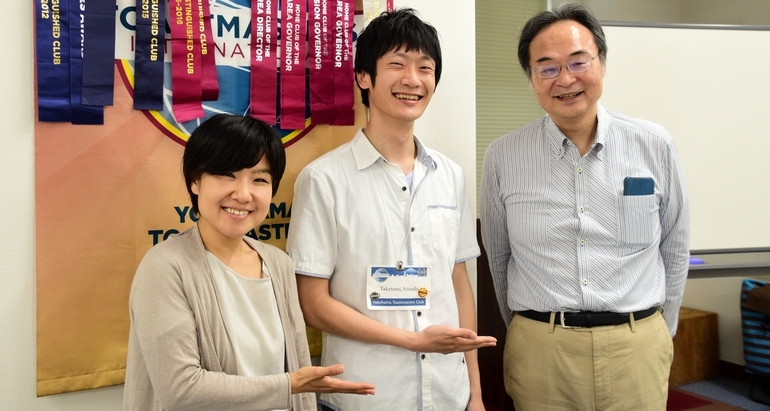 TM T traveled all the way from Okayama to join our meeting. 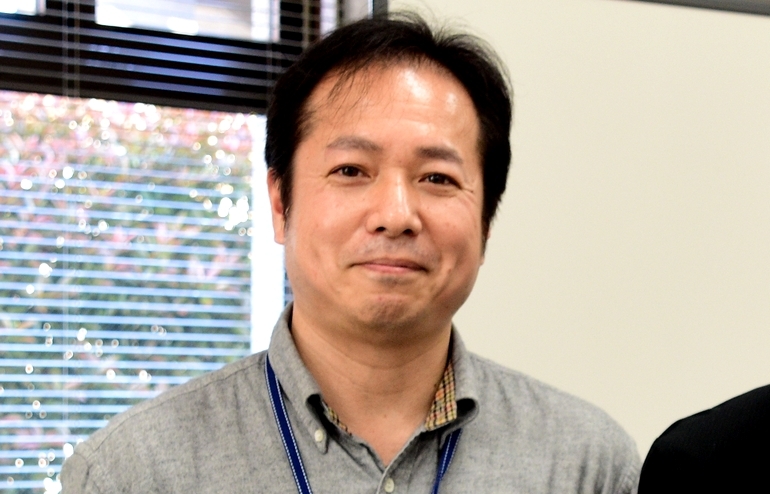 He had been a member of YTMC for a long time and used to join a meeting regularly when he lived in Yokohama, which is his hometown where he grew up. The speech was about his heartwarming memory of his father, and he identified himself and his life with his father’s life. He also sang and entertained us with his wonderful “Kurodabushi”, a Japanese traditional local song his father used to sing. TM N successfully captured audience’s attention by his speech title, “To buy, or not to buy, that is the question”, which was without question inspired by Hamlet. In his speech, he taught us the best time to buy and sell real estate. TM A cast a doubt upon the general interpretation of the Pandora myth and elaborated her own thought passionately. 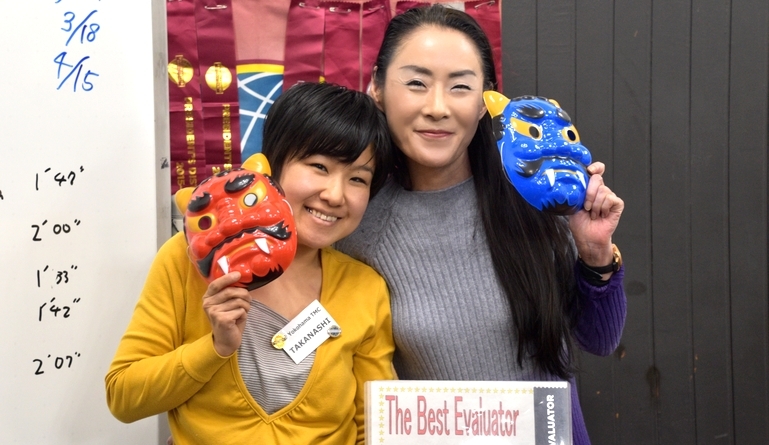 TM I got an honor of the best evaluator. He always delivers suggestions without leaving out anything at all. We hope the rehearsal session gave our contestants an opportunity to fine-tune their already-accomplished speech and made them more confident in delivering them. 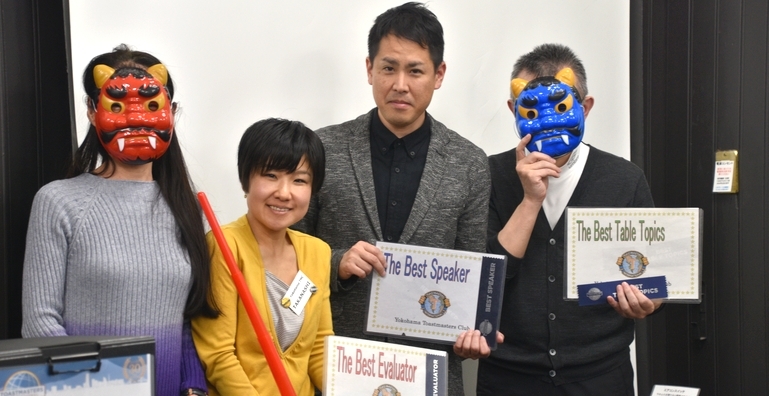 The 660th regular meeting of Yokohama Toastmasters Club was held on the day of “Setsubun”, on Feb. 3rd, 2018. 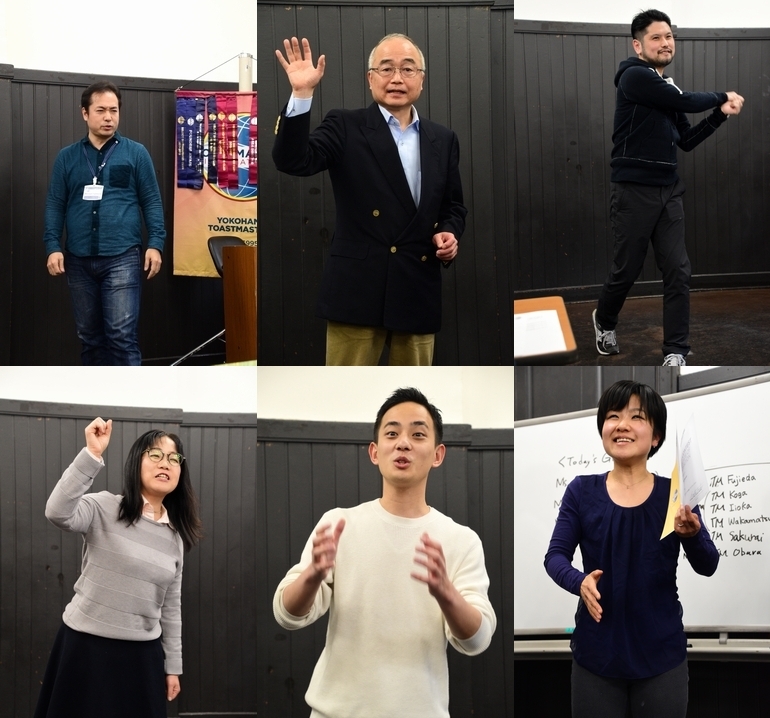 It was too cold to feel like a day before “the beginning of spring”, but despite the cold weather the total of 28 people (24 members & 4 guests) got together at the historical Yokohama Port Opening Memorial Hall, which had been built in the Meiji Period. 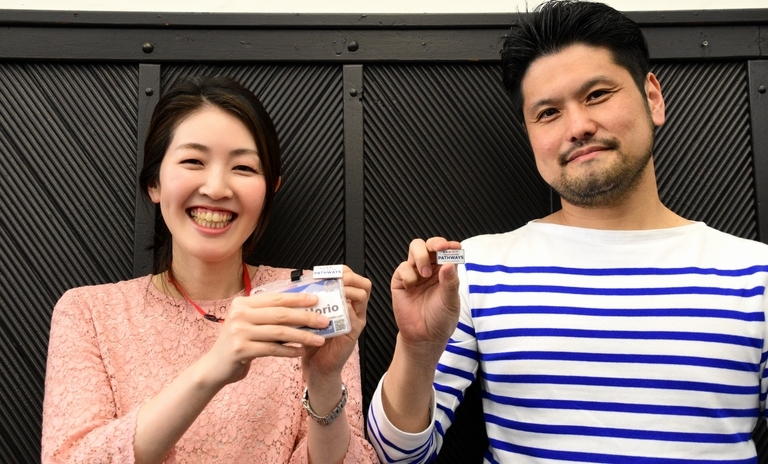 The meeting theme was decided to be “Setsubun” to celebrate the day before the beginning of spring. Prior to the meeting I, a TMOD, asked the members the question; “What is the most unforgettable Setsubun experience you had in your life?” However, I myself didn’t have any unforgettable Setsubun experience. Thus, I made up my mind to make this meeting something memorable for all of us. First, I bought masks of Oni (monster) at a 100-yen shop. Second, I fetched a Lightsaber of Star Wars rolling on the floor of my place to make it a monster’s sword. With these props, I was planning to dance an elegant sword dance of Setsubun monster. However, unexpectedly I sprained my lower back a few days before the meeting. Immobile and despaired, I asked a tall and cool TM T to come to the stand and become a Setsubun monster instead of me. And take a look! He looked cooler than I’d expected him to be. Better than my poor dance! One of the most impressive answers to my Setsubun question was TM N’s memory of her late father. She used to feel ashamed of his loud voice, “Go away evil spirits! Come in good lucks!”, which echoed loudly in the neighborhood on the Setsubun day in her childhood. However, now that he is gone, she misses his loud voice so much. Her love for her late father melted my heart. 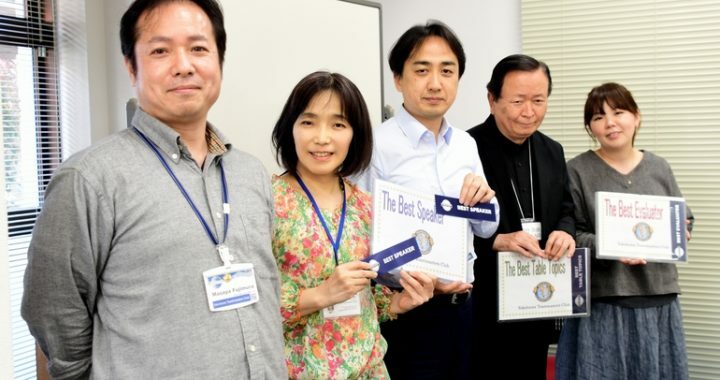 In the Business Session, TM N received the Competent Communicator Award for her successful completion of the C. C. Manual, and she made a few-minute speech to commemorate her achievement. 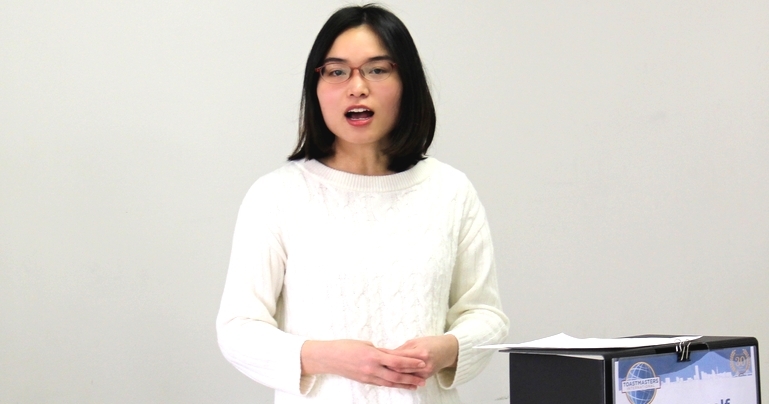 She had prepared a perfect script for her speech as usual and delivered it smoothly. Making a perfect preparation for each speech is time-consuming and tough. However, she always makes a perfect preparation. Her sincere attitude towards making a speech is a good model that all members should follow and learn from. I’ll be looking forward to her further achievements in this club. This meeting’s Word of the Day was “believe”. Although this is the verb anybody knows, according to TM A, who chose this word, Japanese people tend to say “I think…” too much when “think” can be rephrased by other words that also mean “I think”. One of these words is “believe”. She is right. I too realize we say “I think” too much when it can be rephrased by “I believe / I guess / I suppose / I presume / I assume / I’m sure / I reckon / I’m afraid” and more. It seems that I wasn’t the only one who realized that fact, and many members said, “I believe” instead of saying “I think” in this meeting. TM A’s choice of word was proven to be perfect! The first session, which was the Table Topic Session, was conducted by the first-timer TM T. He facilitated the session as smoothly as though he had done this many times before. The theme of the session was “winter”, and the five speakers answered his questions respectively. 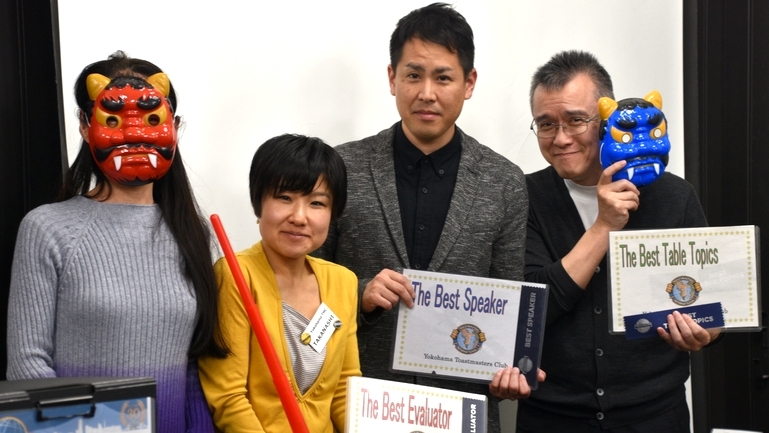 TM M, who talked about his experience in Hokkaido when the temperature was 30 degrees below zero, won the Best Table Topic Speaker Award. 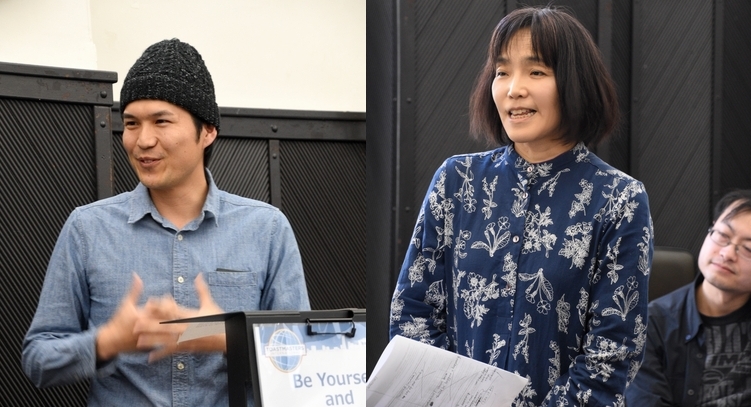 In the succeeding Prepared Speech Session, two experienced speakers, as well as two rookies, made a variety of speeches. Especially, two rookies’ ice-breaking speeches were too good to be the ones made by first-timers. I find that recent rookies who have just joined our club are already accomplished English speakers. 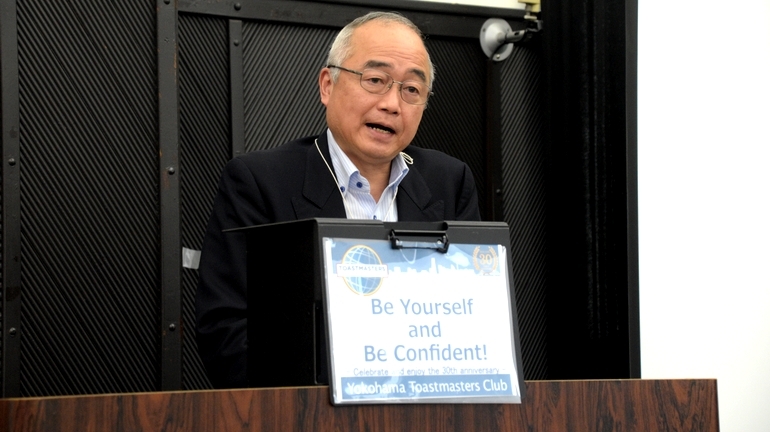 Experienced Toastmasters (including me!) should roll up sleeves once again and try harder to improve ourselves. Out of two experienced Toastmasters, TM H, who is from Vietnam, talked about the patriotism of Vietnamese. Since we Japanese don’t know much about Vietnamese beliefs, her speech was novel and interesting. 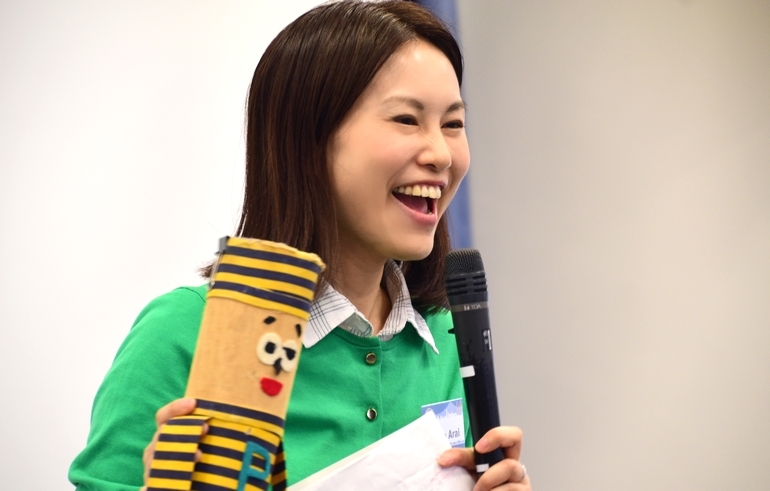 TM T, who was the most experienced Toastmaster in the crowd on that day, made a speech about her husband who had been hospitalized for his injured leg. Her humorous way of talking about her husband was so funny and entertaining. 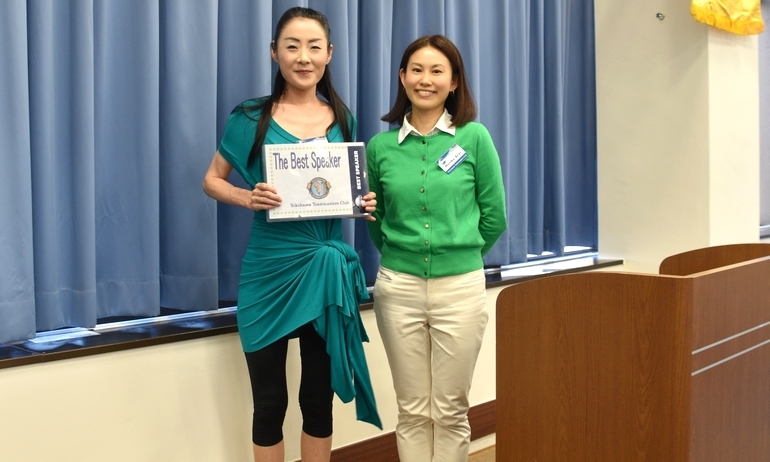 The Best Prepared Speaker Award went to TM O, who made the very first speech in this club. The Evaluation Session was facilitated by TM N, who took the role of the General Evaluator for the first time. Although he seemed a little nervous when he made a general evaluation, he facilitated the whole session with his signature confidence. The one thing I regret was he didn’t have enough time left to make an evaluation for each evaluator. 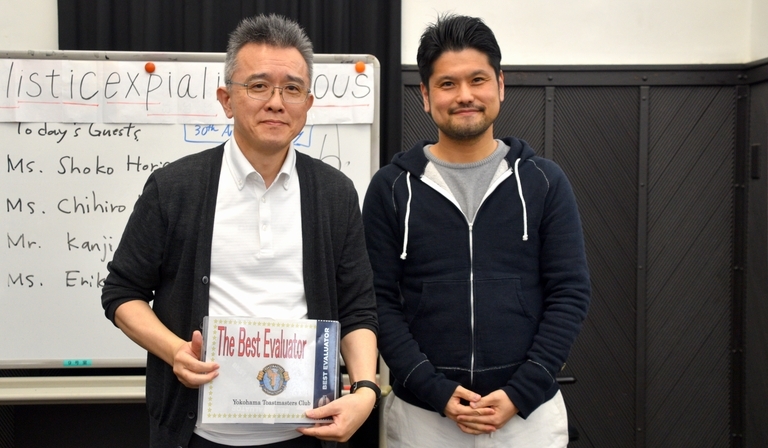 The Best Evaluator Award was given to TM T, our president who made an evaluation of the first speech made by one of the rookies. Last but not least, this meeting started a minute late and closed 7 minutes behind the schedule. Even though a few minutes delay seems nothing, the delay could’ve been avoided if not only TMOD but also the president as well as other session masters paid more attention to time. However, once the session starts the session master can easily forget about time. It may be a good idea to ask Timer remind them of the time during each session. 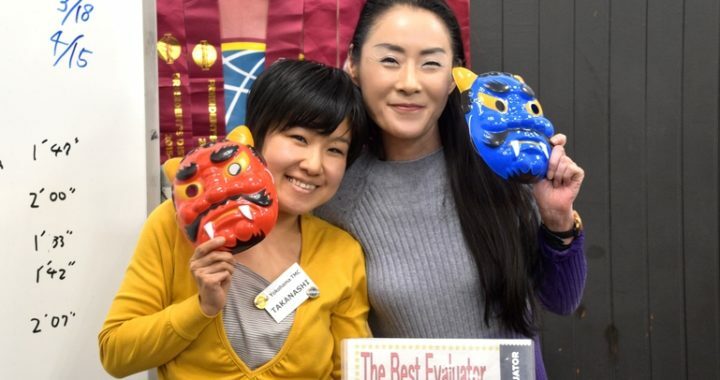 Anyway, the Setsubun meeting went well and we’ll be having the In-house Contest for the Toastmasters International Spring Conference two weeks from now. Let’s enjoy the fabulous speeches of the talented contestants together. I’m looking forward to it! 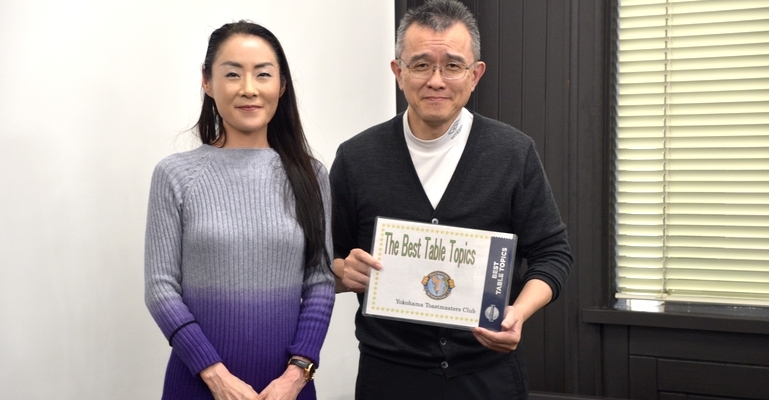 The second meeting in 2018 of Yokohama Toastmasters club was held on the 6th floor of Pio Sakuragi-cho building. Starting with a good news about TM Y ‘s new-born daughter, S- chan, the meeting proceeded successfully with amazing sessions and interesting stories. 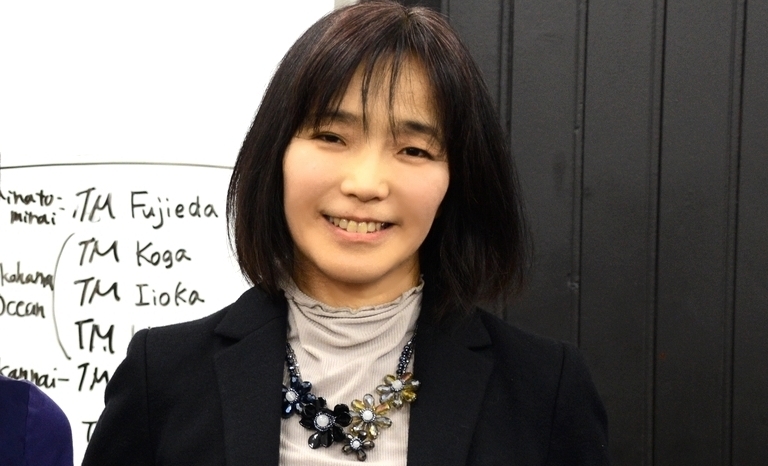 TM N brought an atmosphere of excitement to the audience when she introduced a word dice in the Table Topic Session. She asked all chosen speakers to create a short story including the keyword they got from the dice. 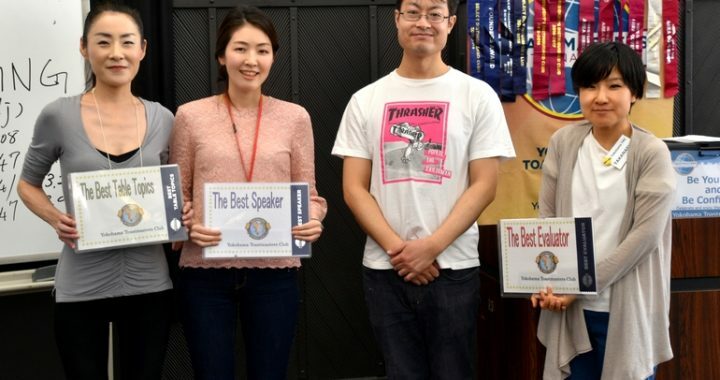 Our VPE TM S won the Best Table Topic Speaker Award by his story about how “by accident” he could invite a friend to deliver wonderful lectures at his university. In the Prepared Speech Session, we had four wonderful speeches from both Competent Communication Manual and Advanced Manual. TM H shared the lessons he learned in England and how people around him changed his point of view. TM K cheered up the room by his humorous “nomophobia” story.TM Ts successfully accomplished her first speech with confidence without using any note. TM T introduced an excavator model and explained its important role in our society. 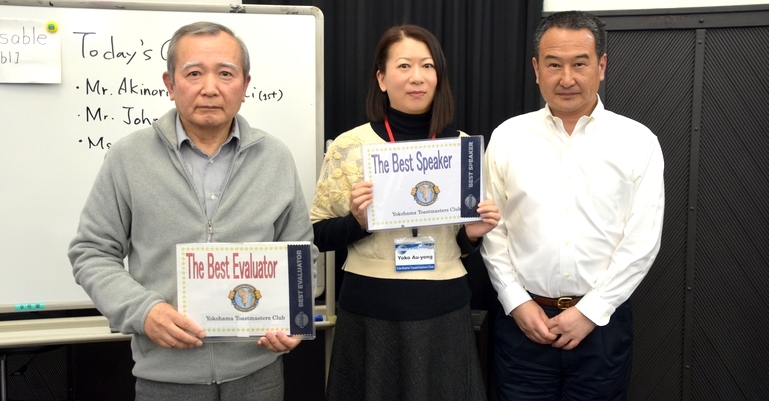 Finally, the Best Prepared Speaker Award was given to TM T.
In the Evaluation Session, TM A got the Best Evaluator Award when she evaluated TM T‘s speech. TM M controlled this session very smoothly even though this was the first time he took the role of General Evaluator. 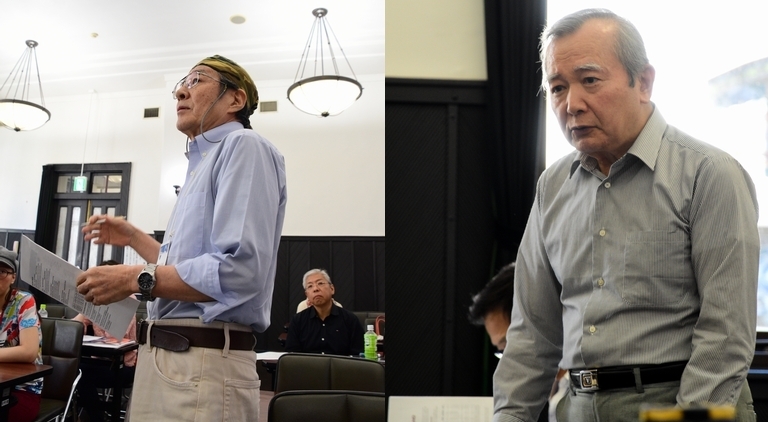 In this meeting, many members tried their roles for the first time. However, they all completed their tasks successfully. Let us challenge ourselves with new roles and enjoy every YTMC meeting in the future.